It features a CREE LED light bulb, three brightness settings to choose from, one fast strobe and SOS mode. It is using durable aluminum alloy and reflector as material, so this flashlight has a tough and long lifespan case. Flashlight: 5.25 long. It is using durable aluminum alloy and reflector as material, so this flashlight has a tough and long lifespan case. Anodized aluminum alloy body. Cost effective easy to find AAA batteries- (one set of 3 included). HUNTING 1200 Lumens LED Flashlight Weaver Mounted For Remington 870. It features a CREE LED light bulb, three brightness settings to choose from, one fast strobe and SOS mode. Includes a Picatinny/Weaver flashlight mount. It is using durable aluminum alloy and reflector as material, so this flashlight has a tough and long lifespan case. Shotgun Magazine Tube Rail Mount. Mounts with the two provided Allen head bolts. Installation may require the user to disassemble shotgun barrel, magazine tube/end. This will allow you to attach multiple weaver & picatinny style accessories (flashlights and lasers) to your shotgun. And Trirail Mount For 12 Gauge Shotguns. 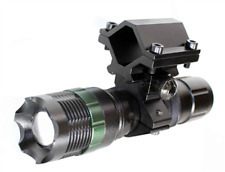 FEATURES OF TRIRAIL SHOTGUN MOUNT Includes mounting hardware This is a quality made all purpose tactical flashlight kit that will suit most applications. With the include trirail mount you can attach this to many different 12 gauge shotguns. 12 Gauge pumpTactical Flashlight Red dot sight, Mossberg 500, Remington 870. It features a CREE LED light bulb, three brightness settings to choose from, one fast strobe and SOS mode. Modes:High, Middle, Low, Strobe and SOS. It is using durable aluminum alloy and reflector as material, so this flashlight has a tough and long lifespan case. Ex-Performance Forend. Trigger Guards. Tactical Light. Fits Remington 870 12g. parts, and accesories. We are Veteran owned & Operated and located in Hays, Kansas. Designed for owner installation. Slings, Swivels, and Mounts. 1200 Lumen hunting flashlight red dot sight kit for Remington 870 12 gauge. 800 Lumens flashlight with red dot sight and mount for 12 gauge remington 870. Made to withstand heavy recoil, 6061 T6 aluminum body with matte black finish, ring mount attaches to weaver/Picatinny mount rail systems. It features a smart, one piece design for clamping 12 gauge shotgun barrels. Made to withstand heavy recoil, 6061 T6 aluminum body with matte black finish, ring mount attaches to weaver/Picatinny mount rail systems. It is using durable aluminum alloy and reflector as material, so this flashlight has a tough and long lifespan case. It features a CREE LED light bulb. It is using durable aluminum alloy and reflector as material, so this flashlight has a tough and long lifespan case. Includes a Picatinny/Weaver flashlight mount. The Mount and Rails are fully Customizable. 1000 Lumens L.E.D Flashlight LED Tactical - Light Kit For Remington 870/1187. ThisGG&G Flashlight & Sling Mount for Remington 870 is manufactured from bullet proof AS-35 Geneva steel and 6061-T6 billet aluminum. Specification:GG&G Remington 870 Sling and Flashlight Combo Mount 12ga. ThisGG&G Flashlight & Sling Mount for Remington 870 is manufactured from bullet proof AS-35 Geneva steel and 6061-T6 billet aluminum. Specification:GG&G Remington 870 Sling and Flashlight Combo Mount Left Hand 12ga. When mounted onto you Shotgun Extended Magazine tube, this will allow you to attach multiple weaver & Picatinny style accessories to your shotgun. 3 Picatinny Rails Per Side. Specification: 12 Gauge Shotgun 5 Position Barrel Mount. Remington 870 Picatinny Saddle Mount. Side Picatinny Mount. Includes: 1 Remington 870 Saddle Mount. Top Rail: 6 1/4". Aluminum Alloy. If you run a gun/airsoft/paintball forum. Lenth 7.5". Matte black anodized finish. Shotgun Magazine Tube Rail Mount. Mounts with the two provided Allen head bolts. Installation may require the user to disassemble shotgun barrel, magazine tube/end. It features a Crisp white bright Cree LED light bulb and it operates with a sliding on/off switch.